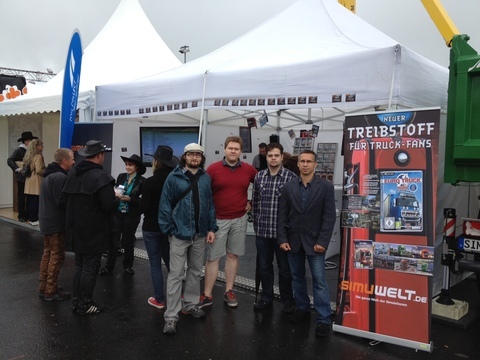 The SCS team is at Truck GP at Nurburgring this weekend with the team from Randomedia which set up a tent where they present their games and where you can play the beta version of Euro Truck Simulator 2. So if you are from Germany or around Nurburgring take a trip to the Truck GP. Will you go there? Let us know commenting right down below. You may also be interested in other Euro Truck Driving Simulator 2 Pictures. This is the newest video of the map from ETS2. In my opinion they should make this game more lively and focus on the things we see ON the road not besides it because you can’t really focus on other things when you drive. That’s what really matters not the things you see far away wich you don’t even have time to see. What do you think about the map? Make sure to comment down below. I found a video on YouTube with a private map for Scania Truck Driving Simulator. The map is made from the free riding mod where there was added a bridge that used to be inactive on the original map. Would you like to get a map like this? Comment and tomorrow I will post a download for a map on this website. You may also be interested in other Scania Truck Driving Simulator Videos. Finally, the SCS team finished the video from the Mercedes-Benz Actros sound recording session that they promised to post about a month ago. The recording session was made with the help of http://www.silentnoise.cz. What do you think about the video? Make sure to comment down below. A great video in wich you will find many interesting things. Enjoy it and thanks to TheTruckSimAddict. Update your copy of the game to version 1.2.1! Two additional Dangerous drives levels: “Fertilizer” and “Roadworks”. I have finally managed to publish the Scania Truck Driving Simulator download page. Also, the pictures and videos sections will be available soon. If you downloaded the game, check out the latest updates in the patches section. This is for a better game experience and a game without any bugs. Don’t forget to follow us on Facebook and Twitter by clicking any of the buttons in the left side.